Pantea Karimi is a multidisciplinary artist with an interest in the taxonomy of image-text relationships. She researches visual representations and textual contents in medieval Persian and Arab and early modern European scientific manuscripts in five categories: mathematics, medicinal botany, anatomy, optics/astronomy and cartography. Through this research project, she also studies the long-term exchange of knowledge across these cultures. In her work, Karimi specifically examines how illustrations in ancient scientific manuscripts played a role in communicating knowledge and how the broader aesthetic considerations of science were closely related to art. Her works collectively highlight the significance of visual elements in early science and invite the viewer to observe science and its history through the process of image-making. She works with interactive installations, silkscreen and digital prints on various substrates and virtual reality. Pantea Karimi is a printmaker and painter and also holds a professional degree with work experience in graphic design, all of which have influenced her fine art aesthetic and practice. As a printmaker and painter, she is obsessed with form and as a graphic designer, she has always been interested in text, design, and layout of books and print media. Her education in graphic design prepared her for both commercial work and academic research. To complete her Master’s Degree at the Art University in Tehran, she researched the beginning of print industry in 19th century Iran, including the first newspapers, which were printed from a stone lithographic process. She gathered reproductions of those newspapers and studied their illustrations, layout, and design. She became fascinated by the ways in which text and image complemented one another in novel ways. Print media became increasingly a major source of inspiration to her, both visually and conceptually. In 2014, she began a new research project which revisited her earlier investigations in the history of Iranian print media. Since then, her work has been an exploration into the pages of medieval and early modern scientific manuscripts. Pantea Karimi has lived, studied, and worked in Iran, the UK and the US and presently resides in San Jose, California. She started her training in painting and classical music at age 14, which led to her decision to pursue art professionally. Karimi earned her MFA in printmaking and painting from San Jose State University in 2009. 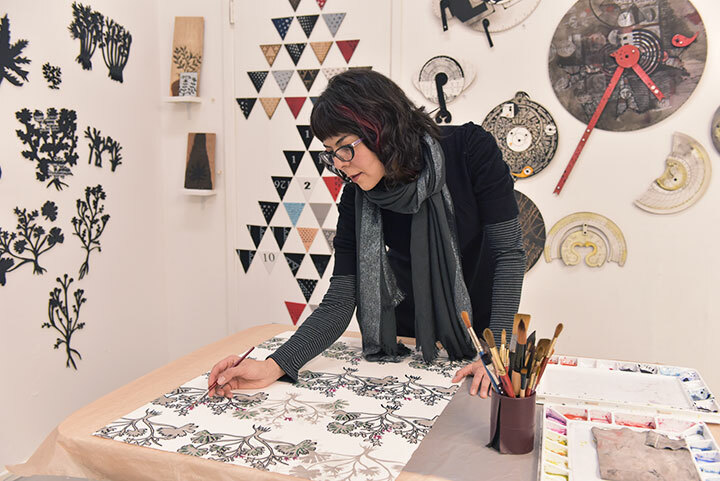 She also holds a Diploma in printmaking and glassworks from Hastings College of Arts and Technology in England in 2004 and an MFA in graphic design from the Art University in Tehran, Iran, in 1999. Karimi’s fine arts and graphic works are in public and private collections and have been featured in several publications in Iran, Italy, Croatia, the UK, and the United States. Her prints and digital works have been exhibited in diverse solo, group and traveling exhibitions in Iran, Algeria, Germany, Croatia, Mexico, the UK, and the United States, including the de Young Museum and the Yerba Buena Center for the Arts in San Francisco, 2012 ZERO1 Biennial, the Google Company and the NASA Ames Research Center in Mountain View, the San Jose City Hall, The San Jose Tech Museum of Innovation, the New Bedford Art Museum and MIT’s Rotch Library in Massachusetts, Pikto Gallery in Croatia and Platform in Germany. Pantea Karimi has given lectures and artist talks in museums and universities including the LASER Talk and the San Jose Museum of Art. Her Research Residencies include The British Library and the Institute Archives & Special Collections at MIT. She has been nominated for multiple awards including The San Francisco Museum of Art’s SECA Award in 2018. She is the recipient of the 2019 Arts and Cultural Exchange Grant in San Jose; the 2019 Silicon Valley Artist Laureates Award; the 2016-2017 Kala Fellowship-Residency Award; the 2011 Multicultural Arts Leadership Initiative Fellowship; and the 2010 Distinguished Artist Award by the City of Cupertino Fine Arts Commission. Karimi is an Adjunct Faculty in the Departments of Studio Art and Digital Media at the College of San Mateo and maintains a studio in Cubberley Artist Studios in Palo Alto, CA.